UNITED NATIONS, June 1 -- As security guards detained two protesters carrying a banner criticizing Dow Chemical's environmental record, the UN's Amir Dossal stood on a stage with Dow's CEO Andrew Liveris, asking the crowd to clap for Liveris and for Dow. Friday's event on the UN's North Lawn was for Blue Planet Run, "presenting sponsor Dow," with the company's red diamond logo emblazoned on all the promotion materials. 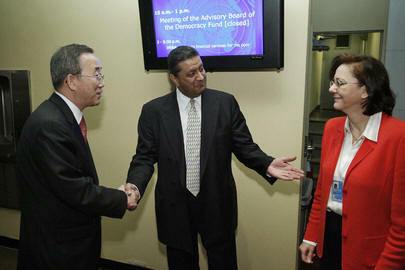 As Inner City Press reported in 2006, when the UN's partnership with Dow was first announced at a luncheon reception in the Delegates dining room, that day's Wall Street Journal quoted Mr. Dossal praising Dow. Less than a month later, when a protest took place across First Avenue from the UN by victims of Dow Chemical's napalm, apparently the UN-Dow partnership was not rethought. Still, the UN and Dow might well have foreseen that there might be a demonstration, or at least the unfurling of a dissenting banner, at Friday's North Lawn event. However, when this reporter sought to follow the two detained protesters with a UN security official across the lawn, another guard ordered Inner City Press "back to the event." "Go back to the event, Mr. Lee," the second security official ordered. This is less a criticism of the UN security personnel at issue than of the wider and higher-up UN, for failing to give any guidance. The UN preaches free speech, civil society and more recently environmental protection all over the world. But in its own compound on Manhattan's East Side, those who unfurl a banner are detained, and reporters who seek to cover the protest and detention are ordered to leave the scene. The UN's uncritical relationship with major corporations was on display just one day earlier, in a May 31 luncheon hosted by Mr. Dossal and headlined by an official from Coca-Cola. Handed out at the event were pamphlets about the UN Global Compact and its upcoming Leaders Summit in Geneva on the 5th and 6th of July. While Inner City Press is on record as requesting advance notice of Global Compact events in UN Headquarters, and an opportunity to pose questions to corporate executives who come for what often amount to photo-ops with UN officials, the first and only alert of this event was in a flier Thursday morning. Inner City Press did not attend the event itself, but spoke with participants afterwards and was told that there was no mention during the speeches that there is a widespread movement to expel Coca-Cola from college campuses, due to such issues as the death of a union organizer in Colombia and alleged abuse of water rights in India and elsewhere. Similarly, at neither of the UN's two events with Dow Chemical there any mention, other than in the quickly re-furled banner, of Dow's record, including that it is being challenged by Amnesty International for not addressing the Bhopal, India poisoning issues it acquired along with Union Carbide. It is one thing for the UN to fail to be even handed, or use its bully pulpit, regarding its partner corporations. It is yet another step to be unprepared for others' criticism of these corporations' appearances on UN territory, to ham-handledly detain peaceful protesters and then order UN-accredited media "back to the event," and away from the detained protesters, right on the UN's North Lawn. We will have more on this.